Start clearing the blocks of the level without using the half blasters or the bombs. When done this task and you’ve finished with the available moves use the bomb in the middle. After that use the half line or column boosters, foreseeing the next combinations of blocks in order to clear out all the blocks of the level. 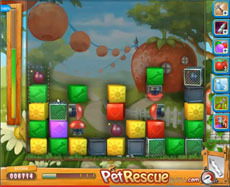 If pet rescue saga 340 seems difficult to you, don’t give up. Watch the right strategy, without boosters, in the following vid.